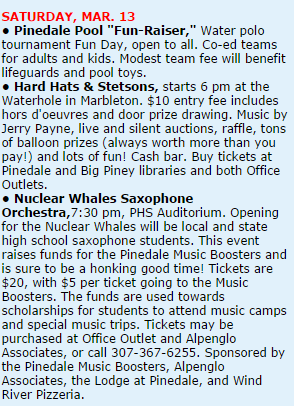 Inspired by a post on another fantastic sax blog I decided to go on the hunt for some Nuclear Whales Saxophone Orchestra information. I knew they were on a permanent hiatus but I wanted to know what has happened since. I have been a fan of theirs for the last 25+ years but hadn’t kept up with the group. I was vaguely remember when group member Ann Stamm Merrell passed away from breast cancer back in 1999 but not much more about the group since then. On a hunch I decided to go internet dumpster diving. A basic trip to their old website netted me information about the Fukushima nuclear disaster and unrelated information. Clearly the domain now belonged to another group. At some point the NWSO decided to abandon the website and as it seems public performances. Instead of wallowing in the nostalgia of bygone days I decided to dive deep and follow the bread crumbs. After scanning the Archive.org site and skimming through page after page of the classic NuclearWhales.com website I found some old gig listings. The last gig documented on the site was for a March 13, 2004 gig in Pinedale Wyoming. I could not find a review of the performance sadly. If this was their last gig then a benefit gig is a great way to end a long run. Kristen Strom – She’s still gigging with her group (The Kristen Strom Quintet), recording, and teaching. Kelley Hart Jenkins – ??? Kevin J. Stewart – Currently with the San Francisco Saxophone Quartet and teaching at Dominican University in San Rafael. If you have any more information on the members of the group please let me know. I’d like to keep this page updated.